There is nothing quite like a summer day spent relaxing on a deck or patio. Without a shady retreat, harmful UV rays or unpredictable weather can cut your enjoyment short. Sunrooms and Awnings offer a variety of ways for you to choose the right shade for your space with Sunspace Sunrooms. Choose from a wide range of customizable home improvement options and products to optimize your outdoor living space. Custom manufactured, Sunspace Awnings offer a wide selection of designs and styles to fit your space. Strong, durable and corrosion resistant. 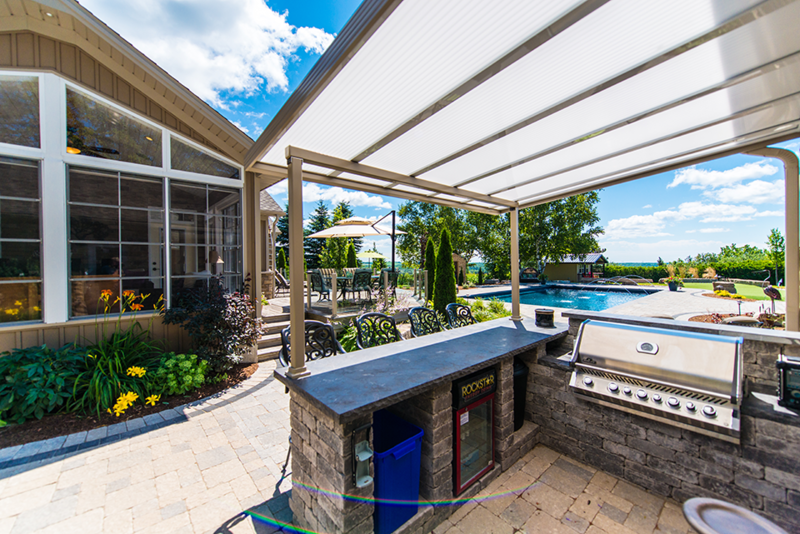 Retractable awnings provide privacy and protection for your space when you and your family need it. Looking to enjoy the sunlight without the UV rays? Sunspace Acrylic Roof Systems offer a filter for your patio, softening the harsh sunlight and protecting you and your family. An Acrylic Roof System can be added to an existing deck, patio or an entirely new addition. It not only provides even light on your patio, but it blocks inclement weather with strong rigid acrylic panels. Available in a range of solar tints– you choose the amount of light and UV protection. A Sunspace Screenroom is the next step from a Roofing system. Providing a shady retreat away from harsh UV rays while providing an insect free space with full ventilation. Easily added to existing roof systems or porches, a Sunspace Screenroom is customizable for your space. Choose from a variety of aluminum colors in stylish and contemporary designs. A screen room is the ultimate summer retreat! For more information on Sunspace Sunrooms and other home renovation ideas and solutions in Red Deer, Alberta please visit www.sunroomsandawnings.com .